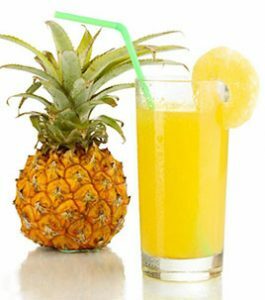 Pineapple juice is a drink made from a mixture of pineapple and salt, which can be used for heat-dispersing, quenching one’s thirst and other curative effects. According to your own preferences, you can add your favorite ingredients. Certainly, different ingredients have different tastes and curative effects. Pineapple fruit is rich in nutrients, such as carbohydrates, organic acids, amino-acids, protein, fat, vitamin ABCG, riboflavin, carotene, thiamine and dietary fiber, iron, magnesium, potassium, sodium, calcium, phosphorus and etc. Pineapple juice has different effects according to different ingredients. Strengthening spleen and stomach, clearing stomach thirst, invigorating spleen, stopping diarrhea, sweet and delicious. Medical functions possess diuresis, heat-dispersing, alleviating a hangover, lowering blood pressure, cancer-combating and etc effects. Eating pineapple properly has a good diet effect for nephritis, dysuria, high blood pressure, hot cough, sore throat, bronchitis, indigestion, drunkenness and other symptoms. The sugar, salts, and enzymes in pineapple have diuretic effects, proper eating is beneficial to nephritis and hypertension patients. Pineapple contains a substance called bromelain, which breaks down proteins. After eating meat or greasy food, eating pineapple is good for your health. Therefore, the Sweet and sour pork (a course of Chinese dish) is safe to eat dishes. “Bromelain” also has the function of dissolving fibrin and blood clots that block the tissues, improving local blood circulation and eliminating inflammation and edema. Persons with stomach cold, cold cough or weak cough are not suitable for eating raw and cold pineapple or drinking raw and cold pineapple juice. Person with skin eczema is not to eat. So how to make pineapple juice in a juice factory? Based on our experienced practice in pineapple juice factory and customers’ feedback and requirements, TICO pineapple juice processing line is designed with the advanced technology from abroad, beaming the charms of Europe and America style. This pineapple processing line with appealing appearance satisfying various tastes and requirements from different customers is widely used to produce pineapple fumet.